The play "Hikosan Gongen Chikai no Sukedachi" was originally written for the puppet theater (Bunraku) and staged for the first time in the 10th lunar month of 1786 in Ôsaka at the Higashi no Shibai. It was not immediately adapted for Kabuki and Namiki Gohei I wrote a similar play, which was entitled "Taikô Shinkenki" and produced by Bandô Iwagorô in the 3rd lunar month of 1787 at the Naka no Shibai [casting]. This drama was staged for the first time in Kyôto the same year in August [casting]. "Hikosan Gongen Chikai no Sukedachi" was finally adapted for Kabuki for the first time the following year, in the 5th lunar month of 1788 in Ise at the Furuichi no Shibai [casting]. It was produced in a major theater for the first time in the 7th lunar month of 1790, in Ôsaka at the Nakaza (casting unknown). It was staged for the first time in Edo in the 9th lunar month of 1796, simultaneously at the Kiriza [casting] and the Miyakoza [casting]. "Hikosan Gongen Chikai no Sukedachi" was a 11-act drama. Its most famous act, the 9th act commonly called "Keya-mura", is regularly staged as an independent drama. Mayumi, okugata of the daimyô Kôri Otonari, pays homage as her husband's proxy at the Sumiyoshi Shrine on the seashore to pray for success of the forthcoming war expedition to Korea planned by the supreme ruler of Japan Mashiba Hisayoshi. In her retinue are Kinugawa Yasaburô, a handsome warrior, and his lover Okiku. Presently Mokusokan, a Korean general, arrives by boat and speaks ill of Hisayoshi, saying that the deity to whom the shrine is dedicated is angry at his maladministration. Yasaburô feels provoked and starts quarreling with him. Mayumi interferes and suggests that Mokusokan and Okiku each pull the reins of a sacred white horse of the shrine from opposite sides to divine the military fortune of Japan and Korea in the coming war. Strange to say, the horse does not budge an inch toward Mokusokan however hard he may pull, while Okiku finds it quite easy to move the horse at will. Mokusokan admits his defeat and asks to be accepted as a retainer of Mayumi's husband through her good offices. In front of the Hikosan Gongen Shrine in the province of Buzen, a woodcutter named Rokusuke seats himself on a rock. No sooner has he started to smoke than a turtledove with its wing pierced by an arrow falls to the ground in front of him. Taking pity on it, Rokusuke removes the arrow and the bird flies back to freedom. Soon two bow-carrying warriors, Enami Ikkaku and Hayakawa Tomô, appear and accuse Rokusuke of interfering with their hunting. The bird was intended as food for their master's falcon. Turning a deaf ear to Rokusuke's apology, the warriors try to take him by force to their master's house for questioning. When he resists their attempted arrest, they fall over backward almost or themselves. Terrified by his enormous strength, they take to flight, though still talking big as they pick up their bows and arrows. As he begins to leave, Rokusuke is called by a dignified-looking warrior, who, after introducing himself as Todoroki Dengoemon, a retainer of the Lord of Kokura, asks him to go with him to meet his master who wishes to employ him as a fencing instructor. Dengoemon also says that Rokusuke's service is badly needed because the warriors under his master's command are going to take part in the planned expedition to Korea. Rokusuke declares that he does not want to be tied to anyone because he has to take care of his aged mother. Dengoemon goes away reluctantly after asking Rokusuke to seek employment with his master if his mother should die. Presently a gray-haired old man appears from a nearby forest and, announcing himself as a divine messenger, gives Rokusuke a scroll describing the secret of the art of fencing. Glad of this unexpected gift, Rokusuke hurries back to his home. The two warriors who had previously tried to arrest Rokusuke reappear and congratulate the old man on his success in handing the precious scroll to Rokusuke. 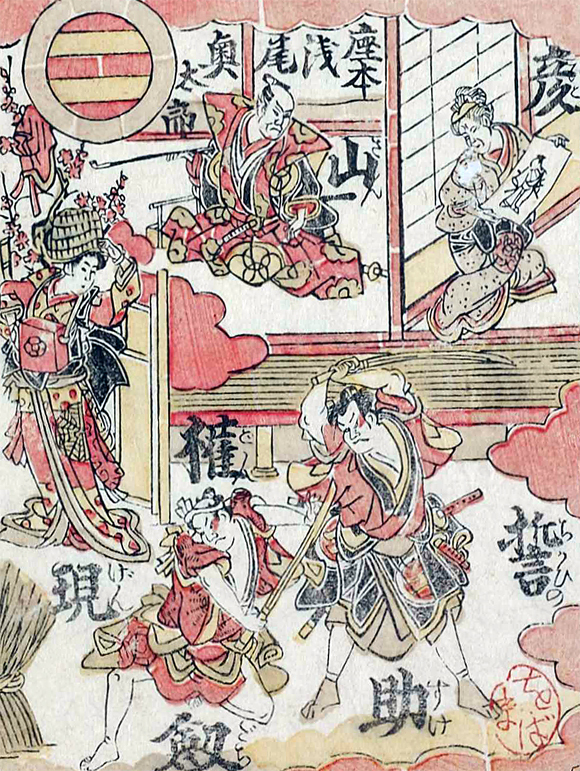 The old man removes his hat and white garment to show that he is in fact Yoshioka Ichimisai, Okiku's father and a fencing master (kengô) in the employ of the daimyô Kôri Otonari. A boisterous feast is going on in the mansion of Kôri Otonari in celebration of his appointment as Mashiba Hisayoshi's deputy in the coming expedition to Korea. After performing a dance, Okiku retires to an inner room and is soon joined by Kinugawa Yasaburô. Though they have a four-year-old son named Yasomatsu, she has had to entrust him to the care of her wakatô Tomohei because she is not officially married to Yasaburô and is serving as Mayumi's lady-in-waiting. She laments over her misfortune in not being able to meet Yasaburô or Yasomatsu openly. Presently a servant enters to announce the arrival of a small boy who is going to entertain the party with his mimicry of a monkey. Mayumi and her koshimoto enter to enjoy the show. When the boy, wearing a monkey's mask, and his attendant arrive, Okiku soon recognizes the attendant as the wakatô Tomohei and the boy as her own son. Though she does her best to conceal her excitement, it somehow becomes obvious to Mayumi that the boy is Okiku's son Yasomatsu. When the boy finishes his dance, Mayumi withdraws, apparently to give Okiku a chance to meet her son privately. Kinugawa Yasozaemon, Yasaburô's father, enters. He tells Yasaburô and Okiku that they are being called by Mayumi and gives the boy a present from her. When all have gone, Okiku re-enters to see if her child is still there. Kyôgoku no Takumi, a fencing expert at the service of the daimyô Kôri Otonari, enters and tells her that he is deeply in love with her. But she repels his amorous advances. Yoshioka Ichimisai enters and, after telling Okiku to withdraw, admonishes Takumi for his shameless behavior. Far from offering an apology, however, Takumi demands that Ichimisai agree to his intended marriage to Okiku. As Ichimisai retires without accepting Takumi's wedding request, Takumi vows to himself to kill Ichimisai if he does not give in. At this moment Harukaze Tôzô, a retainer of Otonari, enters. He advises Takumi in a whisper to challenge Ichimisai to a fencing contest in the presence of their lord and, taking advantage of this opportunity, to beat him to death. When the two wicked warriors have gone, Mokusokan arrives with a wooden box in his hand. Received by Mayumi, he offers her the box. He explains that the box contains a map of Korea which will prove useful in the proposed expedition. Otonari also enters to see the map and listens intently to Mokusokan as he offers a strategic suggestion concerning the expedition. His talk is interrupted, however, by the sudden entry of a man of scholarly appearance. Laughing at what he calls a downright lie, the intruder asserts that the map does not represent the actual topography at all. Angry at his accusation, Mokusokan attempts to kill him with his sword. As they begin fighting, Otonari orders his men to arrest them. Takumi and Ichimisai enter and arrest Mokusokan and the intruder respectively. A stout-looking warrior enters to announce the visit of Hisayoshi to the house. Introducing himself as Sakurai Shingo, a retainer of Mashiba Hisayoshi, he offers to Otonari a sword named Kawazumaru as a present from his master. According to Sakurai, the sword was originally in the possession of Oda Harunaga, the supreme warlord assassinated by Takechi Mitsuhide, one of his generals. Hisayoshi avenged Harunaga's death by defeating Mitsuhide in the battle of Yamazaki. Had Otonari attacked Hisayoshi from behind on that occasion, Hisayoshi would not have been able to defeat Mitsuhide so easily. Hisayoshi is thankful for Otonari's sympathetic neutrality, which helped him take over Harunaga to rule the whole country. Hence this handsome present to Otonari. After the messenger has taken leave, Otonari reverently holds the gift in his hands and wonders where Hisayoshi is. Thereupon the arrested intruder surprises everyone present by announcing that he is Hisayoshi himself. He unties the rope binding him and takes off his hat to show his true Identity. At Hisayoshi's order, Takumi takes Mokusokan to the prison to question him. Otonari proposes to offer sake to Hisayoshi. The two warlords and Mayumi are about to proceed to the main hall when Yasaburô hurriedly enters to announce that Mokusokan has broken out of the prison by some subtle means and escaped, taking with him Mayumi's sword. By way of apology he tries to commit suicide (seppuku) but is dissuaded by Otonari, who advises him to atone for his blunder by distinguishing himself in the coming expedition in Korea. Takumi asks Otonari to let him have a fencing match with Ichimisai in his presence. With Otonari consenting, Takumi and Ichimisai fight with wooden swords. Takumi is defeated. Realizing that he cannot beat Ichimisai in an open fight, Takumi secretly consults with Tôzô and decides upon a plan to ambush him. After they have gone, Mokusokan reappears and approaches the Kawazumaru sword displayed in the room's place of honor. Wishing to steal it, he unsheathes it to find that it is not the real Kawazumaru but a new sword of little worth. Disappointed and about to go away, he promises himself that he will definitely kill both Hisayoshi and Otonari in the future to come. He is called from behind by Hisayoshi who knows that Mokusokan is in fact Yomoda Tajima-no-Kami, one of the leading retainers of Takechi Mitsuhide. The false Kawazumaru sword was used by Hisayoshi as a ruse to confirm Yomoda's true identity. Now that his identity has been discovered, Yomoda Tajima-no-Kami courageously stabs his abdomen with a sword (seppuku). When a warrior approaches him to cut off his head, he declares that he does not want to be killed by anyone but Takumi. Left alone with Takumi, he asks him whether he is Mitsuhide's son. Takumi angrily denies this and beheads him at one stroke. Takumi tries to flee but is interrupted by Yasaburô and several other warriors. Takumi makes good his escape, however, with the help of Yomoda's ghost who appears over the fence. By order of the daimyô Kôri Otonari a new Shintô shrine is under construction in the Province of Suô with Yoshioka Ichimisai as supervisor of construction. A doctor named Shiba Sasen visits the construction site and suddenly falls ill. Three carpenters take care of him and when he feels better take him home. Then, Ichimisai enters, accompanied by Harukaze Tôzô, assistant supervisor of the construction of the shrine who used to be his disciple in fencing but changed his teacher to Kyôgoku no Takumi. Tôzô apologizes to Ichimisai for his discourteous act and asks him to reaccept him as a disciple since he has been disgusted with Takumi's lowly character. Ichimisai gladly complies with his request. A servant comes to report to Ichimisai that his daughter Osono has come from her home to see him and is now staying at a local inn. After Ichimisai has retired to his temporary house in the construction site, Tôzô is visited by a shabbily-clothed rônin whom he soon recognizes as Takumi. Tôzô orders all his men but one named Ekinai to leave. Then, he informs Takumi that Ichimisai is in his temporary house. Takumi wishes to assault him immediately but is dissuaded by Tôzô, who suggests that he should assassinate him with a gun since Ichimisai is a better fencer than he is. Tôzô takes from Ekinai a box containing a gun and delivers the gun to Takumi. To prevent their plot from being discovered, Tôzô suddenly kills Ekinai with his sword. Takumi hides himself in a pine grove and Tôzô goes back to his inn. After dark, Ichimisai comes out of his temporary house and sees stars suddenly cease shining. Feeling uneasy because of this bad omen, he leaves for his home by a palanquin (kago). Many fencing disciples of Ichimisai visit his mansion to greet his blind 13-year-old son Sannojô on the occasion of the Boys' Festival of May 5. One of them is Kinugawa Yasaburô, who is in love with Okiku, the boy's elder sister. Okiku takes Yasaburô into an inner room while Sannojô too is led into another room by his servant, leaving his mother, Okô, alone in the front room. Presently Osono, Okiku's elder sister, returns home. Osono asks Okô to allow Okiku to marry Yasaburô, but Okô disagrees as she believes Okiku must not precede Osono, who is also unmarried and is bound to be Ichimisai's heir in place of Sannojô, who will never be able to succeed his father because of his blindness. Osono then proposes that Okô adopt Yasomatsu, Okiku's illegitimate son, and make him Ichimisai's heir. This, too, is opposed by Okô. She confides to Osono for the first time that she is not her real daughter but was picked up on the roadside as an infant by Ichimisai and Okô when they were travelling to the Ise Shrine to pray for childbearing some two decades ago. Okô also reveals to Osono that the incense burner she now keeps as her treasure was found on her body when she was picked up. Okô subsequently gave birth to Okiku and Sannojô but she makes no distinction between her adopted and her two real children. Osono now feels obliged to reveal a grave affair which she has so far kept secret. She has her father's palanquin (kago) brought in and its door opened. Okô is horrified to find within her husband's body. Servant Sagohei reports to Okô that he was with Osono at her inn when he was informed that Ichimisai had been shot with a gun. Together with Osono he hurried to the scene and found that Ichimisai was already dead. Beside the body was the servant Sachûta, also fatally wounded. Before he died Sachûta told Sagohei that Ichimisai was assassinated by Kyôgoku no Takumi and that Takumi's upper arm was wounded in a sword fight with Ichimisai after the gun attack. Okô, her children and the wakatô Tomohei and Sagohei make up their minds to avenge Ichimisai's death by obtaining permission from their daimyô Kôri Otonari. At this moment Harukaze Tôzô and Kinugawa Yasozaemon, Yasaburô's father, arrive as the messengers of Kôri Otonari. Tôzô announces that Ichimisai's widow and three children are to be banished from their lord's territory as a punishment for Ichimisai's failure to live up to his responsibility as a fencing master. Yasozaemon reveals, however, that Tôzô was an accomplice in Ichimisai's murder and has him arrested and imprisoned. Okô then asks Yasozaemon to see to it that the order for her family's banishment will be cancelled, but Yasozaemon strangely insists that the order has to be carried out. When Osono in turn appeals to Yasozaemon, he orders his men to arrest her. Osono, who is an expert in fencing, easily repels them. In the end Yasozaemon himself tries to fight her, but the daimyô Kôri Otonari makes his appearance and tells her that he had Yasozaemon test her swordsmanship and was satisfied with the demonstration of her excellent skill. Kôri Otonari not only rescinds the order for banishment but also encourages Osono and her family to avenge Ichimisai's death. While the lord is praying for the repose of Ichimisai's soul, Sannojô commits suicide to join his father in the afterlife. By Kôri Otonari's order Osono beheads Harukaze Tôzô and offers his severed head to her dying brother. With Yasaburô assigned to take care of the house, Okô, Osono, Okiku and Yasomatsu set out on their tour for the accomplishment of their mission to avenge Ichimisai's death. Kôri Otonari gives them two swords, a naginata and an important sum of money to cover their traveling expenses. --> A dedicated summary: "Suma no Ura"
Parting with Okô and Osono, who are to take a separate course, Okiku travels around the country with Yasomatsu and their servant Tomohei to search for Kyôgoku no Takumi. One day toward evening they arrive at Suma Bay. Okiku and Yasomatsu rest while Tomohei goes away to hire a palanquin for them as they are very tired. As it happens to be the day of the Obon Festival for departed souls, Okiku hangs an improvised lantern from a branch of a pine tree as a token of prayer. Presently she is visited by a samurai, whom she soon recognizes as Takumi. Taking advantage of this opportunity to strike, Takumi tries to seduce her. Okiku blows out the light and, pretending to comply with his wish, suddenly attacks him with a drawn sword but she is killed by her enemy. Tomohei comes back to find Okiku already dead. To his relief, however, he sees Yasomatsu unhurt because Okiku had hidden him in her luggage before attacking Takumi. --> A dedicated summary: "Hyôtandana"
Disguising himself as a travelling gambler named Dôhachi, Kyôgoku no Takumi preys on passersby by his rigged gambling. When one of the victims accuses him of fraud, Takumi beats him up. He then exchanges pleasantries with street girls (sôka) and goes away. The wakatô Sagohei, a wakatô at the service of Osono, appears and, giving money to the street girls, asks them to go away immediately. After they have gone, Osono arrives in a palanquin (kago) and, pretending to be a street girl, solicits passersby. She inserts her hand into their sleeves and feels their arms as a means of identifying Takumi, who has a scar in the upper arm. She makes her try first on a samurai and then on a sumôtori. The third person approached by her happens to be Todoroki Dengoemon, a former fencing disciple of her adoptive father Yoshioka Ichimisai and now karô of the daimyô of Kokura. He recognizes Osono as Ichimisai's daughter and gives her a wooden travelling certificate which would enable her to pass through barriers (seki) on her tour in search of her enemy. After Dengoemon has gone, the wakatô Tomohei arrives and tells Osono that Okiku was killed by Takumi. As evidence he shows a small bag containing Takumi's navel string which he found beside Okiku's body. He then kills himself by way of apology for his failure to protect Okiku from Takumi's attack. Just before dying, Tomohei throws Takumi's navel string into a pond. In no time clouds of spray rise from the pond and the incense burner in Osono's bosom issues a strange sound. Takumi reappears as if drawn * by a supernatural power. He realizes by intuition that he is the son of the late Takechi Mitsuhide, as Yomoda Tajima-no-Kami suggested before he was killed at Kôri Otonari's mansion. Believing that his deceased father threw his precious Kawazumaru sword into this pond and that his spirit now wants Takumi to recover it, he looks for and finds the sword under floating weeds. Soon after he has picked up the sword, Osono approaches Takumi, pretending to be a street girl and tries to rob him of the sword. Takumi resists. As the two struggle for its possession, the sword jumps onto a gourd trellis (hyôtan). They too climb onto the trellis and continue fighting. At last Takumi makes good his escape, taking the precious Kawazumaru with him. --> A dedicated summary: "Sugisaka"
Three woodcutters visit Rokusuke in his hut in the Sugisaka Cemetery on a hilltop where he is praying for the repose or soul of his mother who died 49 days ago. They take leave after being treated to tea by Rokusuke. A samurai carrying an old woman on his back arrives and Lakes rest near the hut. Rokusuke, impressed with his kindness, asks him where they are going. The samurai says he is travelling around, seeking employment with a daimyô. When Rokusuke tells his name the samurai is pleasantly surprised, for he has seen a notice board saying anyone who defeats Rokusuke in a fencing contest will be employed as a fencing teacher by the daimyô of Kokura. The samurai says that the old woman is his mother who is deaf and seriously ill. As her days are numbered, he wishes to please her by getting a job before she dies. He asks Rokusuke to favor him with a pretended defeat in a fencing contest. Himself bereft of his mother only recently, Rokusuke sympathizes with the stranger and promises to do as he asks. After the samurai and his mother have gone, the wakatô Sagohei and Yasomatsu enter, followed by two highway robbers. Threatened by the robbers, Sagohei tries to fight them off after pushing Yasomatsu into the hut. He is, however, fatally wounded. When Rokusuke comes back, Sagohei has just the time to point at the hut without saying a word before dying. Rokusuke finds Yasomatsu in the hut and takes care of him. Yasomatsu, being a very small boy, is unable to tell his name to Rokusuke. --> A dedicated summary: "Keya-mura"
As he has promised, Rokusuke is deliberately defeated in a rigged fencing contest by the unemployed samurai, whom he met in the previous act in the Sugisaka Cemetery and who calls himself Mijin Danjô. The victor proudly goes away to take service with the daimyô of Kokura. An old woman visits the house of Rokusuke and begs him to be allowed to rest for a while. Learning from Rokusuke that he has lost both his parents, she offers to become his new mother. She also offers him money but he gently bids her wait in an inner room while he thinks the proposal over. Yasomatsu, whom Rokusuke has been taking care of since he picked him up in the Sugisaka Cemetery, comes back at the house. Rokusuke kindly sees to it that the boy has a comfortable nap. Walking the road past Rokusuke's house appears a komusô. Actually this travelling priest is Osono who has adopted this disguise in order to pursue her search for Kyôgoku no Takumi more effectively. Suddenly Osono notices a kimono on display in front of the house and recognizes it as that of her nephew Yasomatsu. As she takes it in her hands, some neighbors, seeing her, think she is stealing it and rush to surround her. However, for Osono, skilled swordsman as she is, it is easy to rout them simply with her shakuhachi. Rokusuke has seen all this from inside the house and realizes that such skill could never be shown by a true priest. He calls out to Osono roughly and she enters the garden and draws forth not a shakuhachi this time but a sword which has been hidden inside it. As she moves to strike again the man whom she assumes, on the evidence of the kimono, to be the murderer of little Yasomatsu's guardian, Rokusuke parries the stroke and shouts that he is innocent. He tells this strange komusô, who talks like a woman and fights like a man, how he found Yasomatsu and took care of him. Osono demands his name and on his reply all her animosity changes suddenly to affection. Rokusuke is none other than the man her father Yoshioka Ichimisai had said, just before his death, that he wanted her to marry. Now Rokusuke learns for the first time of Ichimisai's murder by Takumi and reveals in turn that when Ichimisai gave him his certificate of swordsmanship he told him that he should marry Osono-then only a child-and take on the name of Ichimisai as a worthy successor to that master fencer. Now the old woman who had sought rest in the house reappears and reveals herself to be Okô, Ichimisai's widow, Osono's mother and Yasomatsu's grandmother. To honor her dead husband's wishes she helps Osono and Rokusuke exchange their nuptial vows in cups of sake. Villagers appear carrying the corpse of an old woman slain by a bandit and beg Rokusuke to avenge the crime. They say that the victim is the mother of one of them, a villager named Soma Onoemon. Rokusuke recognizes the corpse as that of the so-called mother of Mijin Danjô. He tells Osono and her mother of this strange puzzle and as they learn the details of his duel the two women realize that Danjô was in reality Kyôgoku no Takumi in disguise. Now that their sworn enemy has just been found, Osono, her mother, Rokusuke and Yasomatsu leave to accomplish their revenge. Kyôgoku no Takumi, now employed in his assumed name of Mijin Danjô as the fencing teacher for Tatsunami, the daimyô of Kokura, is considerably drunk, having been treated to sake by his lord in celebration of his appointment. Rokusuke enters to demand that Danjô have a fencing match with him, for their previous contest was a rigged one. Danjô refuses but the karô Todoroki Dengoemon, tells Danjô that the lord would be dishonored if his fencing teacher refused to accept a challenge. Danjô then attacks Rokusuke with a sword without warning. Rokusuke draws his sword to fight back, but his sword breaks mysteriously. Rokusuke understands immediately that Takumi's sword is none other than the famous Kawazumaru, which easily overwhelmed his own sword. The fact that Danjô possesses the Kawazumaru sword convinces Dengoemon of his true identity. The new kengô is indeed the evil Kyôgoku no Takumi. With Dengoemon officially permitting Ichimisai's bereaved family to revenge his death, Rokusuke fatally slashes Takumi. Then, Osono and Yasomatsu give him the coup de grace. It is often said that the character of Rokusuke is based on Miyamoto Musashi. The role of Osono is considered a challenge for an onnagata female role specialist for its blend of fierce warrior skills and soft femininity. This act was staged only twice between the end of WWII and 2011: in February 2011 at the Shôchikuza and in October 1967 at the National Theatre.